The MHWE450WW front load washing machine from Maytag stands at 38 inches and has a width of 27 inches and 32 inches in depth. This washer is considered to be one of the most reliable models from Maytag and is designed to withstand even the toughest types of laundry. It has many useful features such as the Powerwash cycle, fresh hold option, Sensi-care wash system, and MaxExtract extended spin. 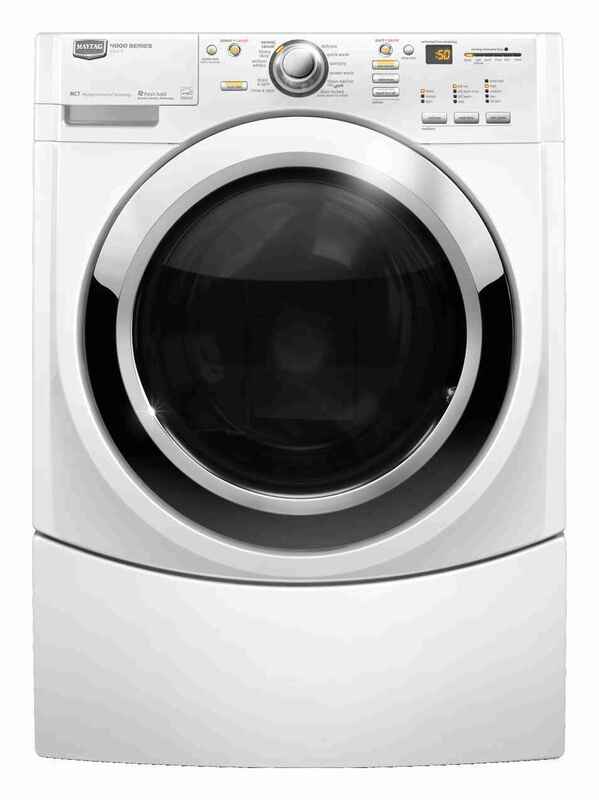 This washer, manufactured with Maytag Commercial Technology has many features and cycles. Its power wash cycle ensures powerful performance and the washer is capable of maximum spin speed of 1300 rpm. The sanitary cycles are NSF-certified and the MaxExtract extended spin option allows for faster drying time. With it’s Fresh Hold option with Dynamic Venting Technology, a built in fan is used to keep your clothes fresh up to 10 hours after the wash. It uses a variable speed motor with pre-selected spin speeds. It uses a stainless steel drum. The Smooth Balance suspension system reduces vibration and noise. The IntelliTemp temperature control allows you to manage temperature settings automatically. It has a 3-tray dispenser drawer for bleach, detergent, and fabric softener. It displays the estimated time remaining for easy monitoring. Comes in white, red and grey. This washing machine model from Maytag has many advantages, and chief among these is its power wash cycle feature, which cleans clothes completely and thoroughly in just minutes. NSF sanitary cycles make sure that your clothes are bacteria-free, ideal for baby clothes and other delicate types of laundry. The sanitary cycles are also perfect for people who are sensitive to detergents. The dynamic venting technology from Maytag is another valuable feature, where clothes come out fresh smelling and clean. The machine is free from any laundry odour as well. The MaxExtract extended spin feature results in faster drying time, leading to better energy savings in the long run. With the IntelliTemp automatic temperature control feature, you can control which temperature setting works best for specific types of fabric, making it highly ideal for more delicate types of clothing. Another advantage to using this front load washing machine from Maytag is its energy efficiency. This model has achieved CEE tier III qualification for economical power consumption. This kind of washer is not ideal for people who have some difficulty in bending or kneeling, as bending or kneeling is often necessary to load and unload a front-loading washer. It costs more than regular machines, making it an unwise choice for people who are working on a budget. We had purchased a Maytag front loader and dryer at our last house. In just under a year (barely in warranty) the washer needed new bearings. It was fixed but never ran the same again. We sold the washer and dryer cheap to move into our second house. We were told that the bearing issue was fixed so we purchased Maytag again. The washer worked fine for just over two years and then the noise began. Again, bearing and drum issues. The "extended warranty" company has offered to replace with another Maytag or a cheap buyout. As the warranty states; this is NOT a purchase price policy. Since Whirlpool bought out Maytag we have never see the lonely repairman commercials again - wonder why!!!! We like to assume we are paying for quality but perhaps a cheap top loader would last longer. I spent all this money a year and a half ago to have the bearings go out already. This is rediculous!!!!!!!!! I wanted to cuss somebody out when I paid the repair man $130 of my hard earned dollars for him to tell me I might as well get a new washer. POS!!!!!!!! I could have done more with the total cost of this washer had I gone to Vegas, at lease I would have had fun blowing the money! Wish I would have read these comments before I purchased this piece of junk! Have had four 9 months and the bearings are already shot. It has always made the loudest noise, we can't even hear each other talk. Spent $700 thinking it would last a while, for sure more than 9 months. Luckily still under warranty, but I am expecting to have a repairman out in a few months again. UGH!!! I work for a nursing home that yes, would be considered a "commercial" application, but this machine already has bad bearings after only 6 months. In this facility it gets used twice as often as it would in a busy home. That tells me the bearings are made to last only around a year or so.This is dispicable. I hope people really start paying attention to which products are junk so companies HAVE TO make them better if they want to sell any. a jet engine in the basement. We purchased this washer and dryer one year and twelve days ago. It has continued to get louder and louder until we finally called a repairman out. The spindle is broken and approx. $800 dollars worth of parts to repair all the damage. Fortunately we purchased an extended warranty but what happened to the Maytag quality? I think as soon as we can repair and sell these it is safe to say we will be looking for something other than the Maytag/Whirlpool line of products. The machine worked great at first, at 6 months it started having problems going through a wash cycle, showing error codes, would reset as I was told to do, then it finally wouldn't reset anymore,the control board went out replacement part was 290.00, company replaced it at no cost, but the 2nd one now is doing the same thing after one load of wash, this machine has been lightly used, after some research it is a common problem with this machine, do not waste your money on this machine!!!! STAY AWAY FROM THIS MACHINE - less than 18 months and the 2nd drum bearing is bad now - we are only 2 people - less than 2 loads of wash per day - STAY AWAY!!!!!!! We purchased this machine at the end of 2010. We were so excited thinking that we had a great "Maytag" appliance. By the middle of June, the noise of the machine was getting obnoxious. It sounded like a plane landing in our home. I called Maytag and it took 2 weeks to get someone out to even look at it. The serviceman confirmed by husband's suspicion that it was the bearings going bad. (just six months old) I understood that flukes happen so just was waiting to get it fixed. The repairman ordered the parts and said he would return in one week to fix it. We got a call from the repairman a week later stating that the parts would be on backorder until atleast Aug. 5th, 2011. I called Maytag and they informed me that they would get a "research" team on it looking for parts throughout the United States. They should find something in about 5 days. That was 3 days ago and now they are saying it will be atleast 6-7 more days before they can let me know anything. My washer now doesn't work after it sounded like rocks were tumbling around in it and has broken, melted plastic all around the seal. DO NOT BUY THIS. I ignored the warnings before the purchase. The no-customer service is terrible and no help. We did love it the first 6 months but now all we get is excuse after excuse on this expensive machine. Bought my front loader in October, made the LOUDEST noise ever, like an airplane landing, could not hear my TV in the front room from the laundry room in the back of the house. Called service, was told it was the bearings and was a 2-man rebuild. Two weeks later, got an error code and my washing machine does not work AGAIN! Called Maytag and they will not REPLACE anything - they must REPAIR. I am stuck going to the laundromat when I purchased a new washer. Wrote to the company CEO, who never responded either. Obviously they know about their crappy quality and DO NOT CARE!!! Where has Maytag Quality gone ? Same story as others Drum needs to be replaced,due to bad bearings. Now no parts to repair with,maybe July before parts are available.I guess this what happens when a company sells out to another company the new company starts using cheaper parts to save money.Washer and dryer only 6 Months old. We have been using this machine for roughly 2 months. We have been nothing but impressed. Cleaning - The auto temp control with the internal heater allows my machine to sit about 20 feet or more away from my water heater and still provide a hot water cycle. Because of the ATC, we have coletely removed tempra paint in my school age child's clothes in one cycle after using a shout spray on the spot. Just last night we pulled dried latex wall paint out of my wife's sock. Shaking/Noise - This machine does not have a self balancing system to my knowledge. However we have had queen comforters and ran a cycle on the max extract cycle and it makes a bit of noise/slight shake. I would expect that if you spin a 20 lb comforter at 1300 RPM it is going to shake a bit. In the first cleaning cycle after I installed, it made some noise when it was washing the interior. So I just expect that it is going to make some noise. If you have it in a closet or seperate room, you will not hear it. Part of the reason I bought this machine was the Maytag Commercial Technology which incorporates heavier bearings and pulleys. Past Whirpool/Maytag machines had trouble with the back bearing on the tub going out, the MCT was one of the solutions they implemented to overcome this issue. Another past issue was small items being sucked into the water pump and causing severe damage. That is not the case on this machine. The water return under the door gasket has 5 small crayola crayon sized holes to return the water. We have found our infant sons socks behind the seal before. I would highly recommend a laundry sack like the owners manual suggests. Another postive for this machine is the warranty offered by Maytag. The motor and tub have 5 or 10 year warranties. This is unheard of in the wash machine world, most are 1 yr warranties. The efficiency of this machine is absolutely amazing. The first month utility bill we saw a drop of roughly 20-25% in our water consumption as well as our electric. Overall affect was a $20 savings. in spin cycle it make so much noise you can't here yourself think. it should of come with earplugs. I would like to never have bought this machine! It does not clean well, and only twists up the clothes. My old Kenmore was so much better. Do not buy the Bravo model!! I am so disappointed in my Maytag washer....it was expensive and worked well. My gripe is that Maytag breaks down within a few years. There are only two of us and it is a top of the line model. Even before the warranty is up, the parts are obsolete so you have to replace the machine. I am tired of replacing every few years. We are a wasteful nation who builds in obsolescence. Start building something to be proud of. For now ....I am checking on replacement part availability as an integral part of buying a new machine. Tired of factories closing that make only the part that you need but for 10 times the original amount, one can be had, if it can be tracked down. Unlike some of these other DB's I find this machine to be outstanding. The performance is way beyond what you will find in a top load washer. I have both the washer and dryer and they are both on 15 1/2" pedastals and as quiet and steady as can be. even during the 13000 rpm spin cycle. Maybe it's just good luck but I love my Machines. Washer delivered Sep 20, 2010. Noticed internal knocking and viberation shortly after started using washer. The problem occured in spin cycle, even with nothing in machine. The larger the losd the worse it is. Repairman sent out from Maytag. He stated that the basket and housing needed to be replaced becausd of faulty bearing. Items are on backorder. The washer was faulty upon delivery, but will not be replaced. Will be repaired under warrenty. Meanwhile we are stuck with a very poor product. We bought this washer and matching dryer six months ago and they are both junk. The washer spins so loudly, you can't hear yourself think and the dryer takes at least 90 minutes to dry three pair of jeans. We called the repairman and he said the washer needed new bearings. He said it probably came from the factory bad. It's been over two weeks and the parts are still on back order. He is also going to look at the dryer when he comes back to repair the washer. We would not buy Maytag again. We have had out front loading maytag washer and dryer for about a year and a half. It is so loud and noisy and shakes....if anything is sitting on the washer it gets knocked into the floor when the washer is going. Also, it only came with a 1 year warranty and now we are getting an error code F25 which isn't even in the manual. We called the store where we bought it and they sent out a guy who Maytag says is not certified to fix this washer. I DO NOT RECOMMEND ANYONE TO BUY THIS WASHER!!!! IT IS JUNK!!! We had done our research and were a little skeptical about front loaders, but for several reasons went forward after talking to several salespersons with the most trust in the Maytag. We've had it now for 4 months and use it for about 5-7 loads/week. It's been a great machine. Had heard about others that had bad experiences with shaking and vibrating, but I was careful to balance the machine and tighten the foot pegs and the machine does not move or shake one bit. We were very happily surprised about how quite the machine is when washing. The only time we hear it is during the spin cycle because it spins so fast. The wash cycle for the front loader is longer than a typical top loader, but its much more gentler on the clothes and we have much less lint now to remove from the dryer. This machine has been running with no problems and is so far serving us great. Highly recommend this machine if looking for a new one. We bought this washing mashine 2 weeks ago and already it has F 25 error code.